Huge Sums Raised, Much Unspent, After Haiti Quake Post-quake charities raised $1.3 billion from Americans to help Haitian survivors. But hundreds of millions of dollars remain in charity coffers, an NPR survey found. The 7.0-magnitude earthquake may have affected as many as 3 million people on the Caribbean island. A woman walks down a path in the crowded Petionville Club camp in Port-au-Prince. 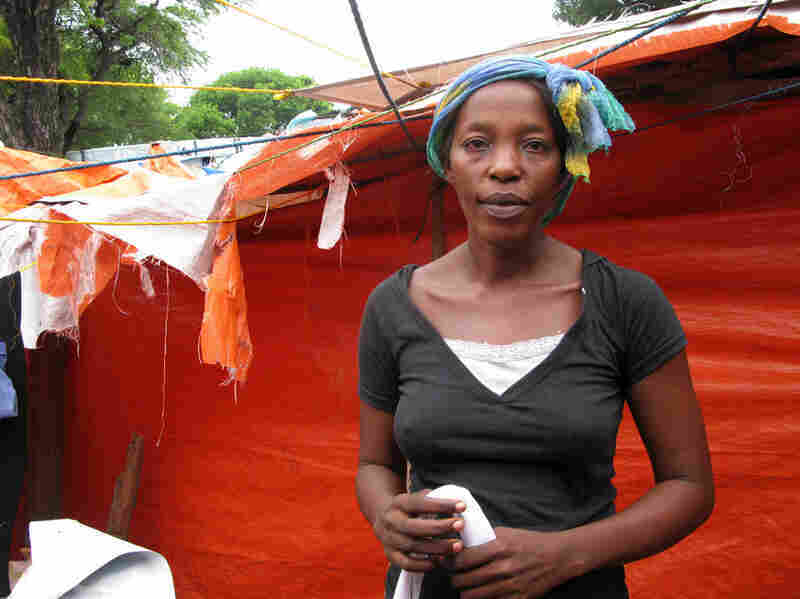 Eva Laurent lives at the government resettlement camp in Corail-Cesselesse, outside Port-au-Prince. 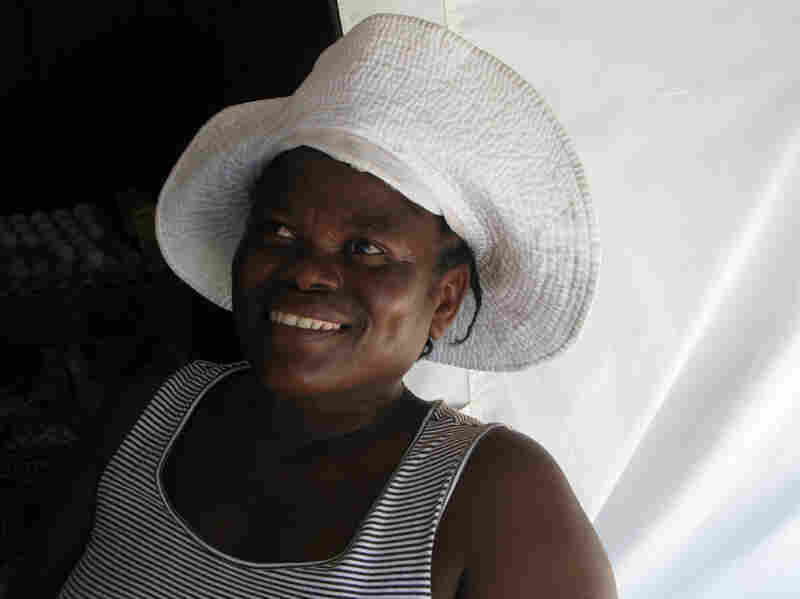 She's one of the many entrepreneurs developing a business in the tent city, selling eggs, fresh vegetables, rum, candy and cigarettes among other things. MFD camp in Haiti's capital is a hive of activity as residents work on drainage channels in preparation for the hurricane season. Teams break up the soil with picks, sweep trash and dig drainage channels in the cash-for-work program. A Haitian woman cooks beans and washes clothes outside her tent. A tarp protects her and her daughter from the scorching sunlight. 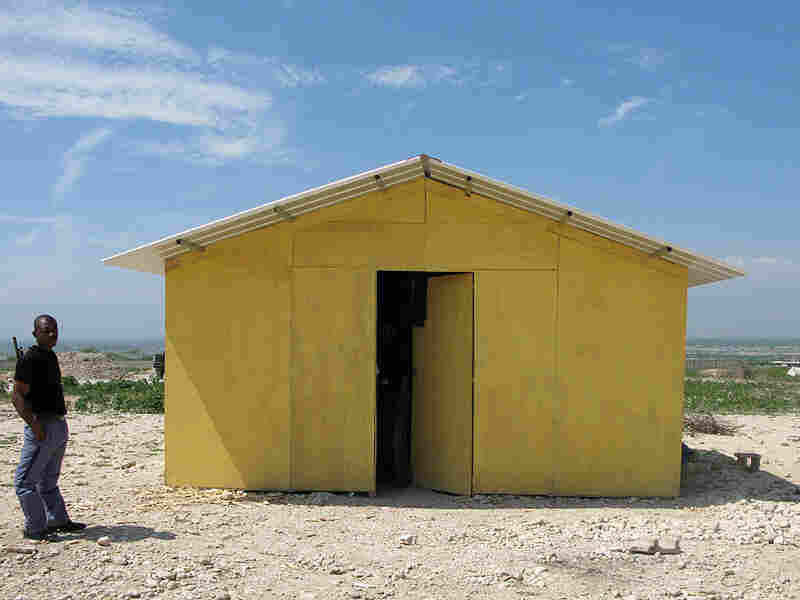 A guard stands outside a prototype "transitional" housing model at the resettlement camp in Corail-Cesselesse. World Vision along with several other aid agencies has developed these small dwellings, intended to house families of up to five people. 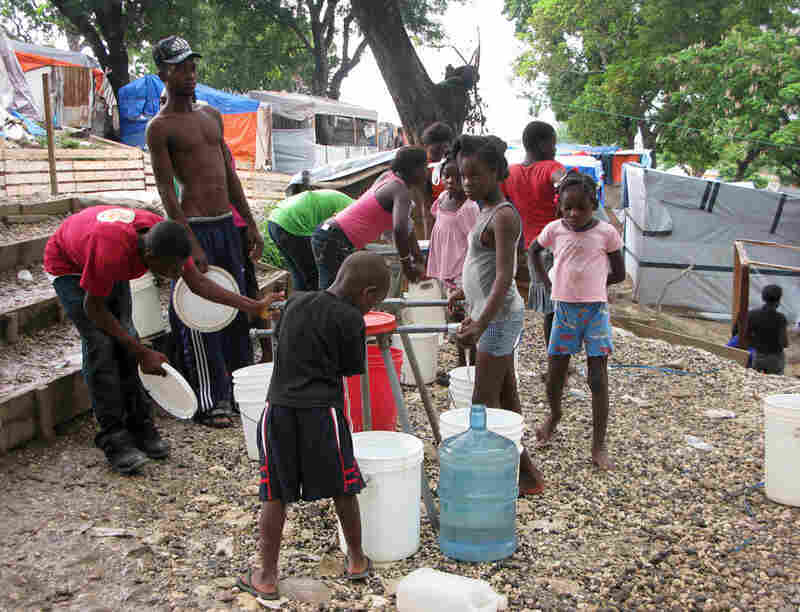 Late in the afternoon at Petionville Club camp, children gather to fill water jugs. The water is purified and safe to drink. Marie Jules St. Julius lives in a tent in the Petionville Club camp, but she sent her two teenage children to live in the countryside with relatives. She divides her time, spending two weeks at the camp — where she sells bags of chips, gum, cookies and cigarettes — and two weeks with her children. Despite the rubble and lack of permanent housing, a positive sign is the vast number of children who have been able to return to school. 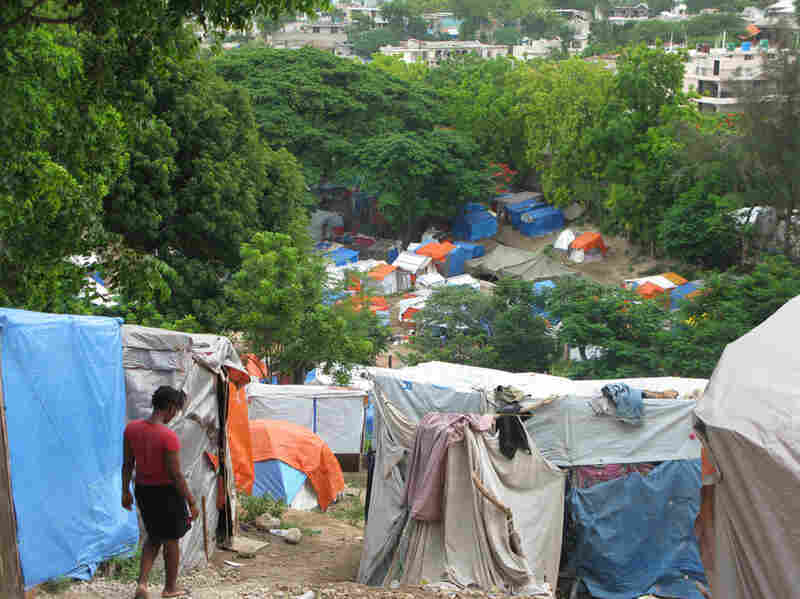 Six months ago Haiti was rocked by a 7.0 earthquake that killed more than 200,000 people, left more than 1.5 million homeless and destroyed the country's capital and surrounding areas. Americans gave generously to thousands of charities helping the Caribbean nation deal with the devastation. Elementary school students donated their pennies while rock stars reunited for an updated version of the "We Are The World" concert. The charitable outpouring for Haiti has been huge. To date, Americans have phoned, texted and mailed in more than $1.3 billion, according to The Chronicle Of Philanthropy. Much money was spent on immediate relief, but hundreds of millions of dollars remain in the coffers of nonprofit organizations from the American Red Cross to Oxfam. The donations to Haiti almost equaled the money raised from Americans after the Southeast Asia tsunami of 2004. However, the donations for tsunami relief were distributed among several countries. The charities directing aid to Haiti say they are spending the money wisely. Legally, American charities only have to account for their finances once a year at tax time. NPR surveyed dozens of groups working in Haiti — including organizations like The Clinton Bush Haiti Fund and Doctors Without Borders. The NPR questionnaire asked about their finances and projects and found that many charities still have substantial amounts of donations in the bank. MFD camp in Haiti's capital, Port-au-Prince, is a hive of activity as residents work on drainage channels in preparation for the hurricane season. Teams break up the soil with picks, sweep trash and dig drainage channels in the cash-for-work program. The Hope for Haiti Now telethon in January, hosted by actor George Clooney with performances from Sting and Beyonce among many others, raised $66 million. Yet it wasn't until last week that the charity announced it was distributing the remaining $35 million. The American Red Cross, with the lion's share of charitable donations for Haiti, raised nearly half a billion dollars, but says it has spent only one-third. Like most groups, the Red Cross says it would not have been prudent to spend all the money raised in just six months. The organization plans to be in Haiti providing relief services for several years. Peter Walker, director of the Feinstein International Center at Tufts University, says that makes perfect sense. "The reality is that after a crisis like this the ability of a country to absorb money and to use it wisely really goes down," he says. While Haiti, the hemisphere's poorest country before the quake, continues to recover from the disaster, there have been no major disease outbreaks. More than 1 million displaced Haitians have some sort of emergency shelter and access to clean water. "I think the first six months' response has been quite effective," says Julie Schindall, Oxfam's spokeswoman in Haiti, "because we are not seeing these mass [post-quake] deaths. We have had a huge disaster here, but these people are surviving." But there are still hundreds of thousands of people living in overcrowded camps in tents and under tarps — a miserably hot and muddy way to live as temperatures hit the 100s and the rainy season is in full force. Disaster experts point to wasted and redundant spending in the aftermath of the 2004 tsunami. "Rebuilding in a country that has been devastated, to use that money wisely, is actually quite difficult," Walker says. 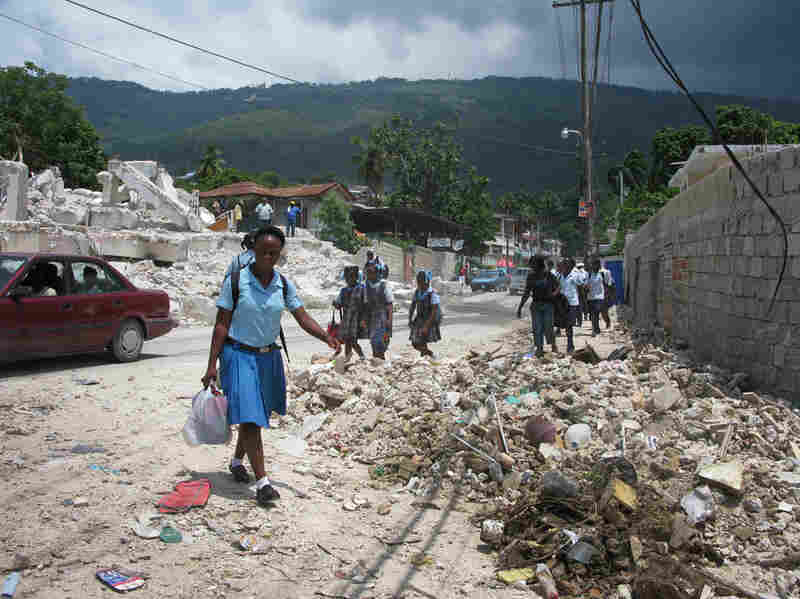 Particularly in Haiti, with its massive casualties and nearly all government offices destroyed, a quicker recovery from the quake was impossible. "If you think about it, ministries have been destroyed. The people who usually take decisions aren't there," Walker adds. Critics say the government, which wasn't strong even before the quake, has hampered Haiti's recovery. Rubble removal is moving at a snail's pace and not enough land has been secured to build replacement housing. Foreign charities are reluctant to publicly criticize the government. But they are discreetly pushing the government to pick up the pace. "We want to see them in the driver's seat, so to speak," said Oxfam's Schindall. "And we know they are going to need help, but they have to take that position." While aid groups may not publicly criticize the Haitian government, the U.S. Senate Foreign Relations Committee has. In a scathing report, "Haiti at a Crossroads," issued last month, Democrat John Kerry blasted the Haitian government for not taking a stronger role in the recovery. Kerry had harsh words for foreign charities, too, which he said need to better coordinate their efforts. "There is a total lack of coordination between themselves and the government," says Haitian Prime Minister Jean-Max Bellerive, who agrees with many points in the report. "We are improving, but it is very slow and the problems are huge and there is a lot of frustration. I believe that is the best word to describe the situation," he adds. Bellerive says he is grateful for Americans' generosity, but he says the organizations distributing that money are too independent and some are not informing the Haitian government about what they're doing in the country. 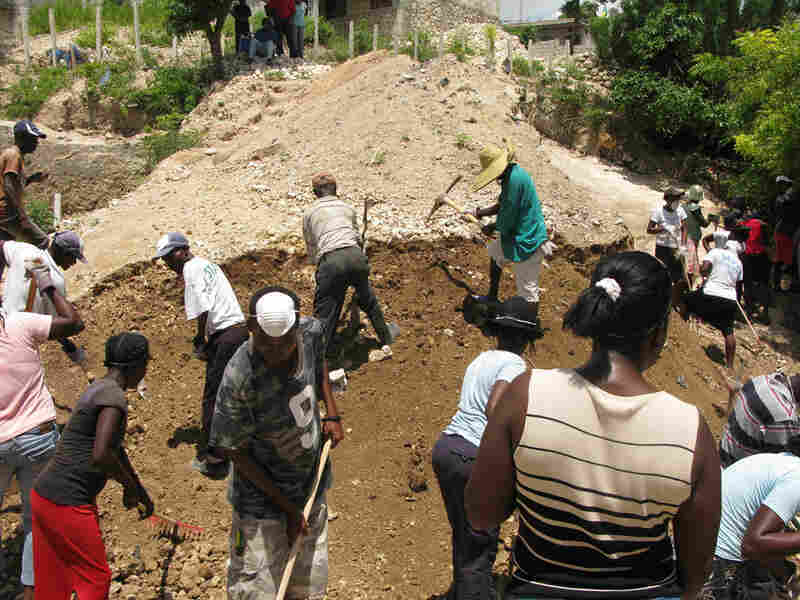 Many of the larger charities have more relief money at their disposal than some Haitian government agencies. The U.S. and other donor countries pledged more than $9 billion to Haiti at a U.N.-sponsored donors' conference in March, but to date they have delivered only a fraction of the money pledged. 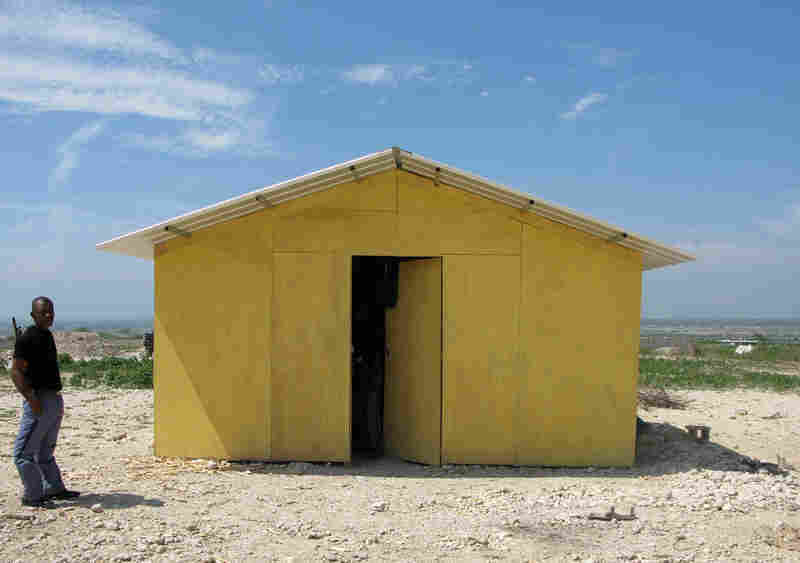 A guard stands outside a prototype "transitional" housing model at the resettlement camp in Corail-Cesselesse, outside Port-au-Prince. World Vision along with several other aid agencies has developed these small dwellings, intended to house families of up to five people. It is a familiar cycle in Haiti. Important development projects are bypassing the cash-poor, inefficient government in Port-au-Prince and instead are financed by foreign charities. "Nobody knows to whom they are accountable to, how the money is spent, where it's spent," says Haiti's former prime minister, Michele Pierre-Louis, referring to aid groups in Haiti. Pierre-Louis currently runs her own nonprofit organization in Haiti. She says aid groups working in the country need to be more transparent. "If you come to help, show us that you are really helping, that the Haitian people, especially the poor, the destitute, those that most need this help, are the ones really getting it," she says. Amid the recovery, there is a lot of finger-pointing going on in Haiti. Meanwhile the situation remains difficult with so many people still living in terrible conditions.